On the first anniversary of the merger of Victoria Chapter No 1345 and Monton Chapter No 6361, Monton Victoria Chapter No 1345 the companions were honoured to welcome Second Principal Grand Principal Barry Jameson as the principal guest. Stuart (right) presents Barry with traditional Eccles cakes. Barry was accompanied by Assistant to the Provincial Grand Principals Colin Rowling, Eccles Group Chairman Stuart Boyd, Patrick Walsh group vice chairman and acting Provincial grand officers James Hardman PrGStwd and David Anderson PrAGDC under the careful eye of Mark Barton PrDGDC. On arrival, Barry was greeted by Stuart Boyd who presented him with the traditional Eccles cakes. The occasion was to celebrate the first installation since the merger of Monton Chapter and Victoria Chapter. The first principal elect Ian Edge was unable to attend, so Alan Perks remained in the chair until the next meeting when Ian will be installed. Amos Millington was installed as second principal by Roger Pottage in his usual assured manner. 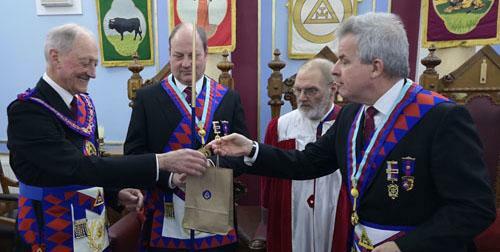 Jerry Lawes was installed as third principal by Amos Millington in an excellent manner. Bill Walker gave the address to the three principals. Pictured from left to right, are: Barry Jameson, Amos Millington, Alan Perks, Jerry Lawes and Colin Rowling. At the conclusion of the installation ceremony, Barry brought the congratulations of the Grand Superintendent Tony Harrison, wishing the three principals well during their coming year in office of this newly merged chapter. He congratulated all who had taken part in the ceremony. Alan Perks then presented Barry with a cheque in the sum of £300 in favour of the MCF 2021 Festival which was gratefully received. The ceremony concluded the companions retired to enjoy the festive board. Responding to the toast, Barry extended his personal congratulations and wished the Chapter well in the forthcoming year. He said that it was good to hear that since the merger, the chapter have had three new members and one joining member and all of which have been invested as officers, saying that this bodes well for the future. Barry thanked Stuart Boyd for his support and the other officers who accompanied him. The festive board was a success with £125 being raised for good causes. Barry with the three principals, grand and acting Provincial grand officers.